Mission: Well known by artists as the “Gift of Time”, the Roswell Artist-in-Residence Program was established in 1967 to provide gifted studio based visual artists with the unique opportunity to concentrate on their work in a supportive, collegial environment for a whole year. This “gift of time” allow artists to work without distraction in an effort to break new ground and focus on individual goals. The Roswell Artist-in-Residence Program serves as a contemporary counterpoint to the traditional arts of the Southwest, reinforces the Program’s interest in strengthening the vitality of art in New Mexico and has been a catalyst in broadening community understanding of contemporary art. Cost: A stipend, or living allowance, of $800 per month is offered along with $100 per month for every dependent living with the grantee. Currently, the cost of art materials is borne by the grantee. In residence grants are offered to artists involved in painting, drawing, sculpture, printmaking, photography, installation and other fine art media. Grants are not made in the disciplines of performance art or production crafts. 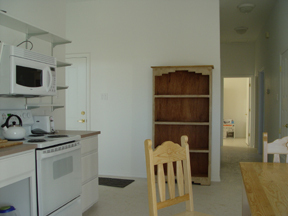 Accommodations: The studios are large, open spaces that measure approximately 30 ‘x 25 ‘x 10’. These areas are well-lighted and convertible to the artist’s requirements. Artists are housed in a complex of six houses and 10 studios located on fifty acres of land. Each artist is provided with a house that can amply accommodate either a single person or a family. Rent, utilities (except telephone), repairs and maintenance costs are borne by the Program. Houses are furnished with major furniture items, appliances and utensils within reason. The printmaking facility is a small, fully operational studio – basically lithographic/etching in nature. The facilities of the Roswell Artist-in-Residence Program are simple and free of frills. They were conceived to be practical, functional and basic. All units are fitted with basic furnishings except bedding. Newly built (2007) the RAiR Residency is made up of house / studio combinations. The main room is a living room, dinning room, and kitchen combination. Kitchen area looking towards entry area. Kitchens are fully equipped. Furnishings are basic. Since artists stay for one year they usually bring some of their own household belongings. Baths include laundry facilities. Bedrooms are simply furnished, utilitarian. A small office with a desk / locker and high speed internet connection. 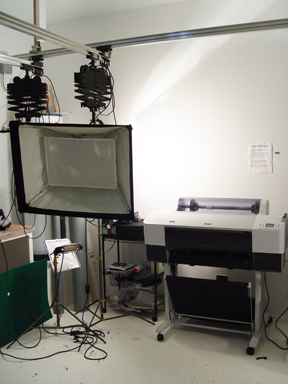 Studios are 30 feet by 20 feet with hot and cold sink, natural, LED track lighting and florescent light. The RAiR Program is not an equipment based residency, but there are a some useful pieces of equipment such as various electric kilns in our new kiln room and a printmaking studio. Printmaking equipment includes a two presses and various other equipment. The printmaking studio, is focused on etching, silk screen and lithographic printing processes. Next door is a studio devoted to computer based activities with a large format printer and various lamps for photography, etc. Like the residency itself, the equipment is modest and basic. Since artists stay at the residency for a full year, most artists bring their most important tools with them. Shop tools includes a drill press, table saw, chop saw, radial arm saw, band saw, sander, grinder and arc welder. 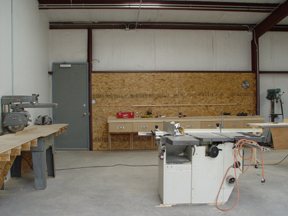 The wood shop is a large, open workspace equipped with all of the basic wood working machines. Hand power tools include: skill saw, drill, router, saws-all, sander, chainsaw, jigsaw, angle grinder and some pneumatic stone carving tools. Roswell (pop. 48,000) is a high plains community (3,560 ft. elevation) and the economic hub of rural southeastern New Mexico. It is roughly 200 miles from the nearest large cities, including Albuquerque and Santa Fe. The economy is based on agriculture, ranching, oil and gas, light manufacturing and tourism. Average seasonal daytime/nighttime temperatures are as follows: Summer (91/65 degrees); Fall (74/40 degrees); Winter (56/28 degrees); Spring (75/40 degrees). The dry season extends from October through June, although snow is not uncommon in winter. Spring is dry and windy, followed by the summer monsoon rains in July and August. Public transportation is limited and some form of personal transportation is advisable. Transportation to and from Roswell is possible by bus or airline commuter service. Demographic/Medium: Professional artists working in drawing, painting, photography, printmaking, sculpture, and other fine art media. Grants are not made in the disciplines of performance art or production crafts. While the visa process for non-US residents participating in our program has improved somewhat, we are still limited in our ability to assist with the long term visa issues that may arise for foreign participating artists. Overseas artists should consider visiting the USCIS web site and/or consult with local experts on this subject. Benefits: A stipend, or living allowance, of $800 per month is offered along with $100 per month for every dependent living with the grantee. Posted in New Mexico, Roswell Artist in Residence Program, UncategorizedTagged 1 year, 10 studios, 12 months, acres, agriculture, arc welder, Art, artist in residence, Artist Residency, band saw, basic, chop saw, community, contemporary, Contemporary Art, convertible, Drawing, drill press, electric kilns, etching, family, fine art media, functional, Gift of Time, grant, grinder, housed, Installation, lamps, large, large format printer, large studio, laundry, light-manufacturing, lithographic, living allowance, New Mexico, oil and gas, open space, open workspace, Painting, performance art, Photography, practical, Printmaking, production crafts, Program, radial arm saw, ranching, Roswell, rural, sander, Sculpture, silk-screen, single person, six houses, Southwest, Stipend, Studio, studio based, table saw, tourism, two presses, utilitarian, visual artists, well-lit, whole year, wood shop, wood working, yearBookmark the permalink.